Kiosk Mode is a special set of tools which will allow you to quickly check-in attendees as they arrive on the day of your event. Since all events are different, each kiosk mode set up will be different. The number of tasks that you require during the attendee's check-in sequence - Scanning a barcode or searching for their record? Do they have a balance due? Allow editing of their record? Printing badges or distributing pre-printed badges? Do the registrants have barcodes? If you're going to scan barcodes, be sure your registrants have barcodes in hand prior to arriving. How do I send barcodes? Once you have defined your check-in process, create an email message and inform them of where to go, how to get there, what to do upon arrival and bring their barcode (included in the message). How do I send Check-in instructions? Will you allow registrations for the event during the check-in process? Will you have self-operated kiosk stations (by the attendees)? OR will you have an attendant manage the check-in process at each check-in station? Will you check-in attendees using a barcode scanner? OR Will you check-in attendees by searching for their name? Will you want to collect payment from those attendees who have a balance due? Will you want to allow registrants to make last minute edits to their registration information? Will you want to print name badges during the check-in process? Any YES answers can be supported when you set up Kiosk Mode. Use the YES answers from step 1 above and then select the path(s) you will need from step 3 below. 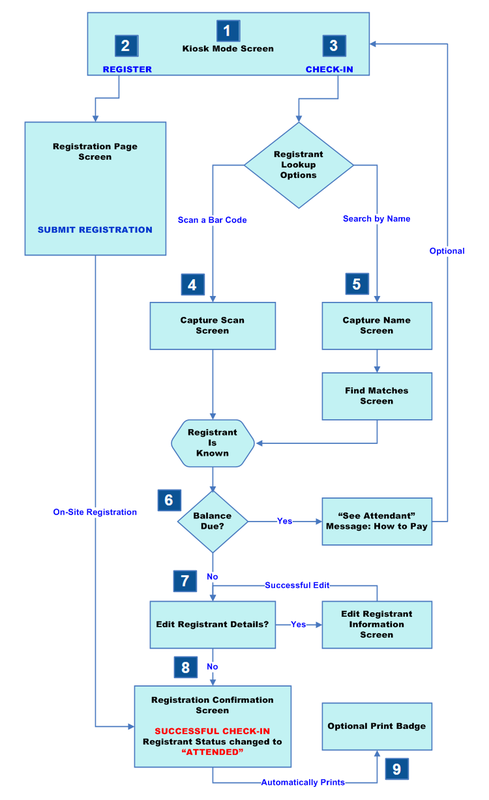 This graphic illustrates two possible paths for attendees within the Kiosk Mode tool. One is optional; one is required. Both paths #2 and #3 require a special URL which is only available on the Kiosk Mode screen. The numbers in the blue boxes below refer to the numbered sections on the On-site Kiosk Mode screen. 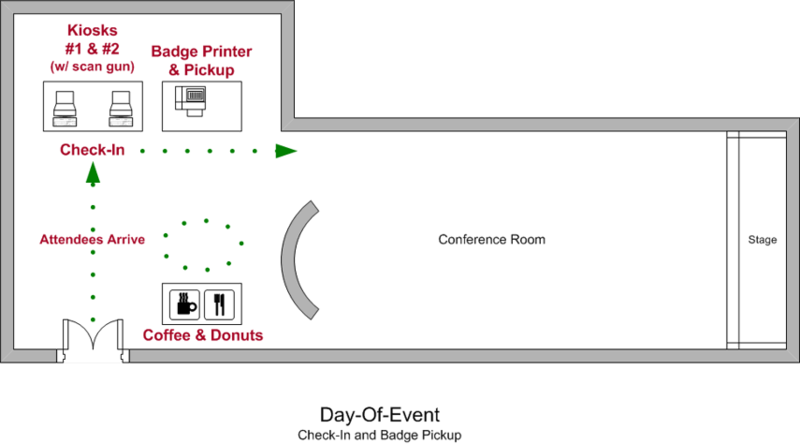 Below is a floor plan that illustrates how the flow of attendees would go through a check-in process. Checking in triggers the registrant's record to be marked Attending. It can also automatically send the name badge to the printer, if you have one configured and connected to the kiosk computers. You want to determine how much time is required to check-in one person. The examples below are rough estimates. Your actual times will be different. Your testing will give you the number of seconds/person required for check-in. Self check-in (with payment and info update) clearly requires more time per attendee. Click the URL on the Kiosk Mode screen - DO NOT USE your event's URL. How do I test my kiosk mode? Since the ultimate goal of the check-in process is to mark the registrant's record as Attended, then each time you test, you will mark some person's record as Attended. However, they haven't yet attended because the event has not yet occurred. In order to test, you will need to have some actual registrant data. The best and quickest screen from which to get this data is on the Event Attendance Manager screen. Both Registrant ID and Last Name are included. Depending on how you set up your kiosk mode, either one of the Registrant ID or Last Name columns will be needed. Open the Event Attendance Manager screen - doing so will give you actual data, either the Registrant ID for scan a barcode or the last name for search by name - leave this window open; you will be returning to get another person for the next test - Where is the Event Attendance Manager tool? Open the Kiosk Manager screen on your Admin Dashboard - Where is the Kiosk Mode tool? Zoom: How do I test my kiosk mode? This INFOGRAPHIC compares all 5 rsvpBOOK check-in options. Have a look at the rsvpBOOK Mobile Web App for your event. It automatically contains a barcode that can be scanned on the day of your event. So if you email the Mobile Web App's URL to all of your registrants, they will all have a barcode. Prev: Where is the Event Attendance Manager tool? Next: How do I set up Kiosk Mode?